California Knife and Blade, Proudly Delivering Low-Cost High-Quality Industrial Knives and Blades within the Proven Shortest Lead Time. Welcome to California Knife and Blade (now, Part of Baucor), machine knives, the leading manufacturer and supplier of industrial blades, machine knives and custom surgical blades. California Knife and Blade is committed to manufacturing and supplying highest quality industrial blades, machine knives, and surgical medical blades at affordable prices and within the quickest turnaround time while delivering exceptionally right on time. California Knife and Blade specializes in manufacturing custom industrial blades and is able to supply thousands of quality off-the shelf standard blades in various dimensions and sizes directly from stock for a wide variety of converting and medical applications. 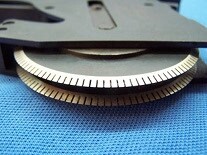 We also provide highest level of precision knife sharpening and grinding service for our customers. From prototyping to high volume production, California Knife and Blade provides highest quality technical expertise and capabilities in manufacturing your cutting tools. Offering each customer optimized solutions on their cutting blade needs for over 30 years, California Knife and Blade has held a strong presence in the market and continues to lead technical advencements in converting and medical applications requiring razor sharp blades. Whether you need a technical advise on custom industrial blade or are planning to make your next purchase for an off-the-shelf standard industrial blade, California Knife and Blade has the right technical and human resources you will need to get the job done. Converting, Medical, Tire and Rubber Processing, Packaging, Food Processing or Paper Processing are only a few of the industries that we serve. For a full list, please follow the menu on the right. If you don't find your area, we can still custom-build your blade. Please contact us today for an exceptionally high quality customer service integrated with our technical staff helping you get the most optimized industrial razor slitting blades that go far beyond your expectations. For most inquiries, same day quote is guaranteed. We can help you with any of industrial blade, machine knife or surgical blade requirements. Just contact us via phone, fax or email and let an highly experienced blade specialist help you right away.